Is Baltimore police detective Liam Van Zandt living in The Twilight Zone? It sure looks that way. The victims in the murders he’s investigating seem to have been crushed by a cursed statue.In the middle of his investigation Liam is fighting his attraction to the mysterious Dr. Bartek Szala, a police consultant and amateur folklorist. With everything coming to a head and his Captain breathing down his neck, Liam has been denying his attraction to Bartek. But when they are thrust into a supernatural world of witches, vampires and werewolves they have to join forces or they won’t survive. Will Liam and Bartek come out alive or will they succumb to the danger that surrounds the Legend of Black Aggie?CONTENT WARNING: shifter knotting, vampires and one confused police detective who still can't figure out this supernatural stuff. 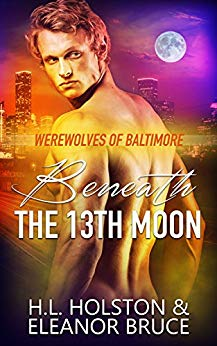 Second book in The Werewolves of Baltimore series. While it would help to read the first book, this is a stand alone novella. No cliffhanger, HEA guaranteed.